HOME IS WHERE THE HURT IS! Right, let’s talk Cybertron. In fact, let’s talk ‘Return to Cybertron,’ the next four-part mini-epic from the alt. movie universe saga running in the Transformers (UK) comic/magazine. As always, the following contains teasers (rather than out and out spoilers), but if you’d rather not know at all, look away now. Okay, it all kicks off in TF-UK #17, as the escalating crisis on Earth necessitates a desperate plan and—for Ironhide, Bumblebee, Arcee and Armorhide—a not so happy homecoming. But, first things first! The current (sad) state of planet Earth necessitates some expert know-how, which leads Optimus Prime to summon a team of specialists (headed by Evac, making his comic strip debut). In the wake of the destruction of the All Spark (in ‘Twilight’s Last Gleaming’), things are looking decidedly terminal for terra firma, and the President wants action. He gets it. ‘Subtle’ just ain’t in Evac’s crew’s toolkit. And what of Cybertron itself? What could possibly merit a virtual combat drop into a world currently as barren hostile as they come? One word: Nucleon! What’s waiting there for Ironhide and his team? All I can say is, someone hasn’t given up on Cybertron. In fact, they’ve gone to great lengths to see the planet rise like a phoenix from the ashes. But, of course, there’s a price… a really, really BIG price! You won’t believe where we’re going with this one! TF-UK #17 is out on the 9th of October. Hoo-hah! 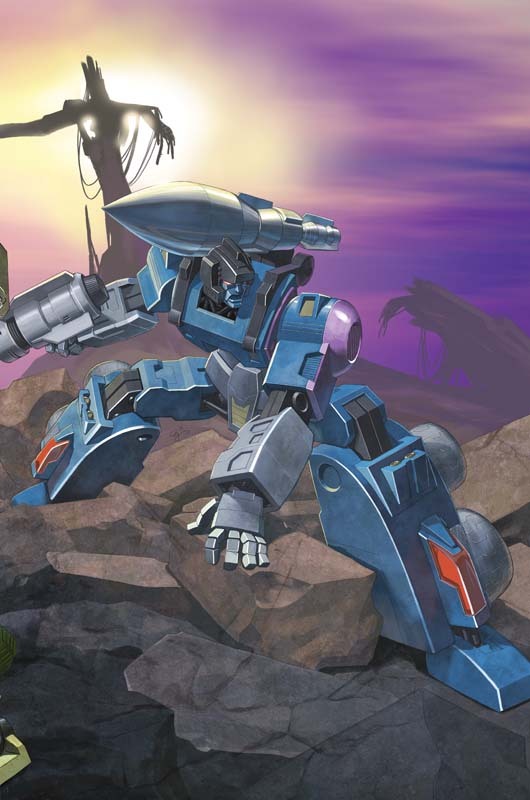 Art for part 1 of ‘Return to Cybertron’ is by Jon Davis-Hunt. Out this week, from IDW Publishing, is Transformers Spotlight: Doubledealer, part three of the epic ‘Revelation’ arc. Things really kick into high gear this issue, as the Dead Universe cast (Nemesis Prime, Cyclonus, Galvatron, Straxus, Grindcore and Jhiaxus) make their presence well and truly felt. As two universes begin to mesh, perhaps irrevocably, the Autobots struggle to understand exactly what has been set in motion (and how to stop it). They need answers, and what better place to get them than from “the font of all knowledge, known and unknown” (aka The Magnificence). Last seen in Spotlight: Hot Rod, this mysterious alien artefact has been carefully hidden away ever since, but now—with the end of everything looming—it may be the universe’s last best hope. It’s up to Hot Rod and Dealer to retrieve the Magnificence, but (unknown to Hot Rod) Dealer has only his own interests at heart. Dealer’s dalliances with Banzaitron’s Decepticon secret service earned him the sobriquet Doubledealer, and he’s about to make it his own by ensuring that the job he started in Spotlight: Hot Rod is comprehensively finished this time around. Deceptions, doublecrosses and deceit abound as events steam headlong towards their shocking conclusion. Plus, more on the Autobot ‘Pretenders,’ Optimus Prime vs Nemesis Prime (at last!) and a shocking reappearance by… well, wait and see. Transformers Spotlight: Doubledealer hits stores this Wednesday (20th) in the US, Thursday (21st) in the UK. Interior art is by Dan Khanna, with covers by EJ Su and Nick Roche. Click on the thumbnail below for a look at EJ’s (interlocking) cover. 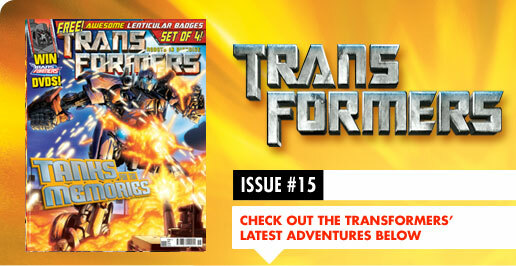 Out this week from Titan, in the UK only, is issue #15 of their utterly essential Transformers comic/magazine. The lead strip, written by me and drawn by TF newcomer Kieran McKeown (inked by Kris Justice), is the second part of the 2-part ‘Aftermath’ story, which picks up on our still reeling cast of Autobots and humans (and planet Earth too for that matter) from the epic ‘Twilight’s Last Gleaming’ arc. Set, as that story was, in the alternate post-movie universe unique to the Titan TF comic, ‘Aftermath’ shows the extent of the fallout from the Decepticon occupation of North America (and their attempt to rewrite the essential geological structure of the planet). Right now, though, the Autobots are an endangered species, Starscream (via his mind-controlled human puppets in high places) manipulating events to rid himself of Earth’s protectors. Under attack from NATO mobile artillery, defending the sick and wounded in a field hospital, Optimus Prime’s forces have their backs well and truly up against the wall. And as bad as it seems right now, it’s going to get much, much worse. In just two issues’ time, the biggest TF-UK storyline of all kicks into high gear. If you thought ‘Twilight’s Last Gleaming’ was the pinnacle of excitement, think again. The countdown has begun to… ‘Return to Cybertron.’ Look for the Script (W)rap for the first part of that arc very soon. TF-UK #15 is in-store on Thursday August 14th. It’s the turn of Transformers: Maximum Dinobots #2 for the post pen-to-paper postulations. Those of you who would rather avoid all spoilers (though, as always, I aim for teasers rather than out and out spoilers) turn away now. For the rest of you, here’s how things are shaping up: the good news is, after about 10,000 years or so under solidified lava (see Spotlight: Shockwave for details) all the Dynobots are finally reunited. The bad news is, after about 10,000 years or so under solidified lava (see Spotlight: Shockwave for details) all the Dynobots are finally reunited. Not a typo. Things go from the ‘worse’ of last issue to almost unquantifiably bad (especially if you’re Grimlock!) this issue. As Skywatch and the Machination (the former unaware that the latter even exists, let alone is tampering with its mind-controlled mechs) play puppeteer with the fates of the individual Dynobots (we’re still a script or two off them formally becoming the Dinobots with an ‘i’), so the good citizens of Fallon, Nevada brace themselves for some truly foundation-shattering (rather than trouser-shattering) Dinobot on Dinobot action. And as if that wasn’t enough, the massed forces of Scorponok’s Headmaster army are, erm, massing on the Fallon city limits, ready to make very sure there are no survivors. As for Agent (Joshua) Red of Skywatch, he’s got an assignation of his own, one that starts to tie up yet another loose end (or two) from the last two years or so of the IDW/TF-verse. Oh, and Hot Rod fans — brace yourself. It’s that bad. Really. Nick R still isn’t talking to me. Maximum Dinobots #2 is scheduled for December 2008. Just a very quick reminder that I’m at Auto Assembly in Birmingham tomorrow, Saturday 2nd. Come see my wares! Get stuff signed. And… news has broken, over at Newsarama, of the sequel to my Terminator 2 series for Dynamite. Check out the Q&A here. More, more news on this very soon right here. You are currently browsing the simon furman blog archives for August, 2008.